Remember, as a supercomputer created by IBM beat Gary Kasparov at chess? The company recently released its technology forecast for the near future. Of course, central to this forecast takes Artificial Intelligence. At the end of 2016 the Big Five have already met to develop a common direction on this issue. All will benefit from its introduction into our life - cars, science, and medicine. The first supercomputer will run our cars, and then turn on the diagnosis and treatment of the most complex diseases. If you look at previous predictions from IBM, always a percentage of predictions come true was higher than failed. In the last week the company reported its financial results for the fourth quarter of 2016 and surprised everyone who was watching them. Share price was 13 cents higher than expected, and revenue forecast for 2017 and 2018 is still high and is around $ 80 billion for each. Shares of the company show us the bullish model with enviable persistence. Stocks after moving in a flat range just broke out and flew up. The last two days the movement was very powerful. 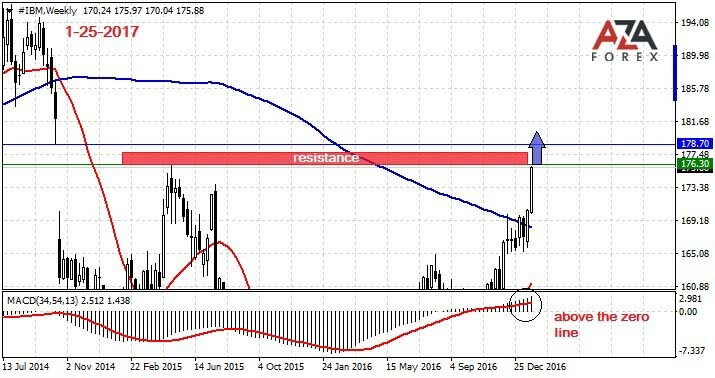 The share price tends up to the strong resistance level of 176.30. It was the opening price after a strong fall with a gap, which can be clearly seen on the weekly chart. If investors have enough optimism, and traders will be able to see the potential earnings for this situation, it will take up bullish sentiment and the stock price will reach the target. Of course, a small correction is possible, because the level is strong and the price unlikely will take it in one breath, but patient trader always go in time in the market at the lowest cost. The target is set at the upper boundary of the gap.